At risk of sounding cliché, we’re right smack in the middle of the season of giving. And when it comes to giving, there’s no better example in our industry space than the topic of communities. Moz itself is a great example: You — the reader, the commenter, the Q&A inquisitor, the subscriber — are what sustains and inspires us. What kind of value does your community add to your site, and how can you provide incentive and value to your site contributors, social media fans, and influencers? 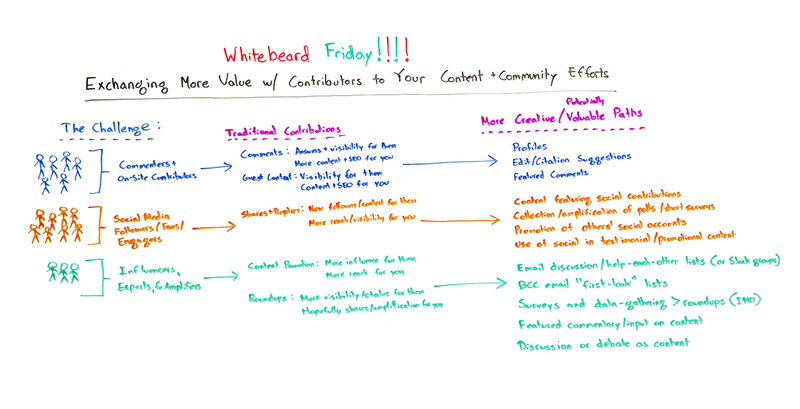 In today’s Whiteboard Friday, Rand explores ten fresh, actionable strategies you can use to encourage and promote an exchange of value with your contributors to feed your content and community efforts. Howdy, Moz fans, and welcome to another edition of Whiteboard Friday. This is a special Whitebeard Friday edition of our show. We, of course, have the annual tradition where I wear the beard, but you know the beard gets in the way of a lot of me talking to you. So I’m just going to wear the hat for today. I hope that’s all right. And I hope you’re all having a wonderful holiday season. Christmas and Hanukkah start the same day this year. New Year’s, of course, Kwanzaa, whatever you’re celebrating, a very happy holiday to you. So let’s chat about exchanging more value with the contributors to your content and community efforts. So basically, I think, in the holiday season, we talk a lot about exchange of value and exchange of gifts and of giving, and that’s wonderful. We do this on our websites as well. So you’re watching Whiteboard Friday. You might leave a comment in our comments section. You might tweet about this. You might put it on Facebook. You might share it on LinkedIn. There’s sort of a community of things going on here. Most of the ideas that I have for Whiteboard Friday come from people like yourself in the community who have ideas and questions, concerns and issues, and that’s a wonderful thing. But what I found is that 99% of the time we all follow exactly the same patterns in our content and our community efforts with how we basically use each other’s value and exchange value with each other. So here’s the challenge. Look, lots of the people who might be commenters are also influencers. Lots of the people who are social media followers may also be on-site commenters. That’s definitely the case. But traditionally, the contributions look like this. For these folks, when they leave comments, they are seeking answers and visibility. So they want to show maybe something that they have done, and they also want an answer or a reply from you or from someone in the community. They have questions about it. And for you, you know they’re creating — well, I promised myself I was going to do red and green so I’m a very Christmassy Jew this year — more content and SEO for you, which is great. That’s one of the big values of comments, absolutely speaking. That’s one of the reasons we try and render comments on the page so that the engines can crawl them. It can help you rank for more long tail stuff. It can certainly help you with engagement metrics and all those kinds of things. Now, for guest content, which a lot of folks do create and allow, Moz certainly has historically through YouMoz and soon we’re going to be allowing that through the main blogs, so you might be seeing more guest contributions there, visibility for them and content and SEO for you. Same story there. Now, shares and replies on social, it’s essentially you are helping to … when you create content and when you, whether that’s content on the social media platform or on your own website, that you’re amplifying, when other people share that content or they like it, they reply to it, they amplify it, that’s new fans and followers and content for them, hopefully, and it’s more reach and visibility for you. With influencers, experts, and amplifiers, pretty much the story is like more influence for them through contributing to your content or promoting your content, and more reach for you through those influencers and experts’ audiences. This is certainly powerful and useful too with roundups, which I think, unfortunately, have become the default style in which people use influencers and experts in many, many fields. It’s more visibility for them, hopefully, because they appear in that roundup. They have their names cited and all that kind of thing. You’re hoping that they’re going to share it and amplify that content so that you get more reach to their audience. Maybe they’ll even link to it, which will get you links. So if we’re talking about these commenters and on-site contributors, I want you to think about profiles. This is something that most comment plug-ins don’t allow by default. Disqus creates a profile, but that profile lives on Disqus’ site, not on your site. Think about your Moz profile. Think about your LinkedIn profile. Think about the profile that you create on lots of community-focused websites, like an Inbound.org or a Hacker News or something. Like there’s fundamental value to having that. You can own that content. You can now promote that page. You can rank in search engines with it. All those kinds of things. Edit and citation suggestions like places like Wikipedia have. Others have notable ones. Medium, obviously, has the highlighted section. It’s a little more creative. Promotion of other people’s social accounts. One of the things that I think far too few social accounts do is actually call someone out by name and say, “Hey, this is another really valuable page on Facebook that you should check out.” Or, “This person did this wonderful thing.” I see too few Twitter accounts, including the Moz Twitter account doesn’t call out as many people, in non-reply tweets, as we probably should or could, and I think that’s another wonderful thing that we can do. Use of social, of course, in testimonial and promotional content. We started doing that where we actually said, “Hey, someone said something really nice about us on Twitter or on Facebook or on LinkedIn. Let’s reach out to them and say, ‘Hey, could we use that on our website, on our product page, to help get you visibility and show that you’re an expert in this field, but also to help us sell this product that you apparently love? '” Win-win there. Again, a wonderful way to creatively use that same type of content. And last, with influencers, with experts, with amplifiers, I think there’s vastly more ways to do this in roundups. First off, I’ve seen some folks create some great email discussion, the help-each-other type of lists. I’m part of a few of those. I love them. There’s great content on there. I think this is a wonderful way to get influencers and experts on your side in the long term and to help them help each other as well as you. I’ve also, just recently, become part of a few BCC email lists, where a couple of content creators in the technology and entrepreneurship space, when they have new content to share, they share it first with this BCC email list before they even promote it to their regular audiences. That’s awesome. That gives me a chance to be one of the first people to show it to everyone. I, of course, benefit from that through sharing with my audiences, and they benefit through the additional visibility that I give them. Surveys and data gathering, I’m a much bigger believer in surveys and in showing data than in roundups. I think roundups that just are text only and have a bunch of text, rather than show data from a lot of influencers and saying, “Hey, you know, we interviewed 100 startup CEOs and we got these 5 data points from each of them, and here are the distributions.” Vastly more interesting than, “Here are the two sentences of advice that every startup CEO gave about how to hire your first engineer.” That kind of thing. Featured commentary and input on content is another way to do this. So, essentially, you share content with influencers. You say, “Hey, if you have some featured comments or some ideas around that, send that back and we will include it in the launch of that content.” Lovely stuff there. I’ve been part of a few of those and I love those. All right, everyone. Hope you have a great holiday season and a great year. We’ll see you again next week for another edition of Whiteboard Friday. Take care.